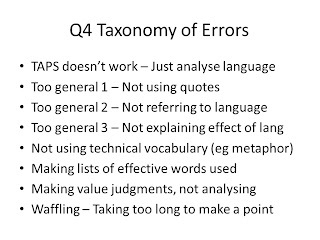 I am writing this post to outline and to describe a technique I learnt some years ago from a long-forgotten colleague that has had a very positive impact on my teaching and the learning of my students: the Taxonomy of Errors. As well as describing the technique I want to show how I have developed it in recent weeks, how I have used it proactively with my students and what impact it has had on their written work. Hopefully it may be useful to one or two of you. In essence, the Taxonomy of Errors is a response to that perennial problem faced by teachers of dealing with a class that are all making the same mistakes. It is a method for trying to ensure that students learn from each others' mistakes as well as from their own. It is a method for trying to ensure that when they next attempt the same task, they will improve markedly rather than incrementally because they have addressed a range of foibles in their work. In practice, the Taxonomy of Errors is little more than a summary of all the feedback that you have given to the students as individuals with a focus on the comments you have written time after time after time. Sometimes I have even been known to rank them in order of frequency!!! 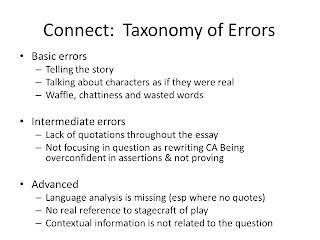 This is an example of a Taxonomy of Errors (ToE) for my top set English class. I took them over two weeks ago and immediately got them to complete a full practice exam for me so I could see what they could do in the heat of battle. This is the ToE for the important question on the Writing Section, which requires them to analyse language across two non-fiction texts and make comparisons. As you can probably guess this response was not perhaps their finest hour, mainly because they had forgotten exam techniques in ensuring that they performed well in their controlled assessments. This strategy is part of my portfolio of tools for getting them prepared for their exams later this month. You will notice that the vocabulary is negative. Although I sometimes write ToEs positively (there is an example later) the intention is to be bluntly honest about what went wrong, and the fact that the list is based on the whole class makes it easier to be so (although I am bluntly honest individually too!). 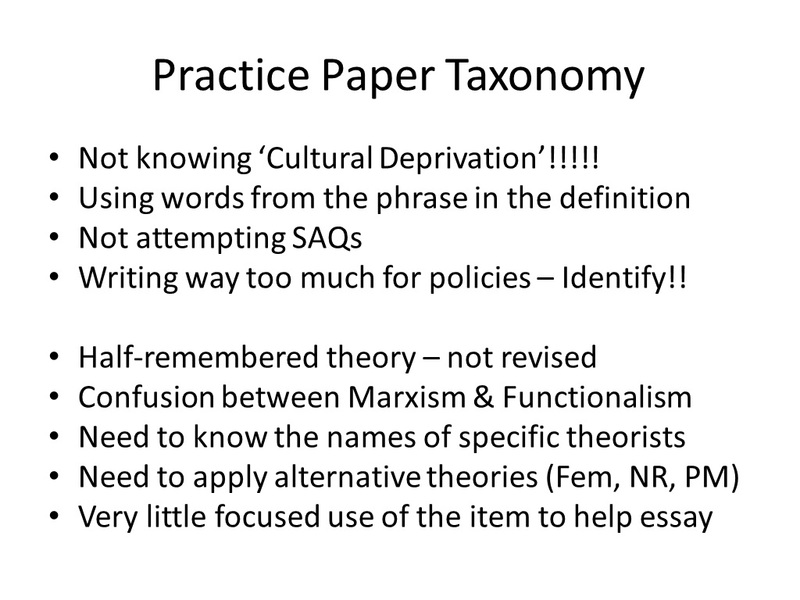 Here is another example of a Taxonomy of Errors, this time in response to a collection of timed essays from my AS Sociology students. In this ToE I made an attempt to separate out the basic errors (at the top) and the more complex error (at the bottom) to ensure that they understood the things that they really ought not have done, regardless of their ability, and the genuine areas for further learning. I always find that at this time of the academic year students facing imminent external examination make all kinds of foolish errors and they need to be scuttled in order to allow them to get at the more important stuff that will genuinely allow them to achieve higher grades (we always call them the Sheep Grades because they are B, A, A* - Geddit?). I always present this feedback at the very start of the lesson after I have marked the work and am increasingly linking the feedback directly to the activities of the next lesson so that they improve upon their work immediately. 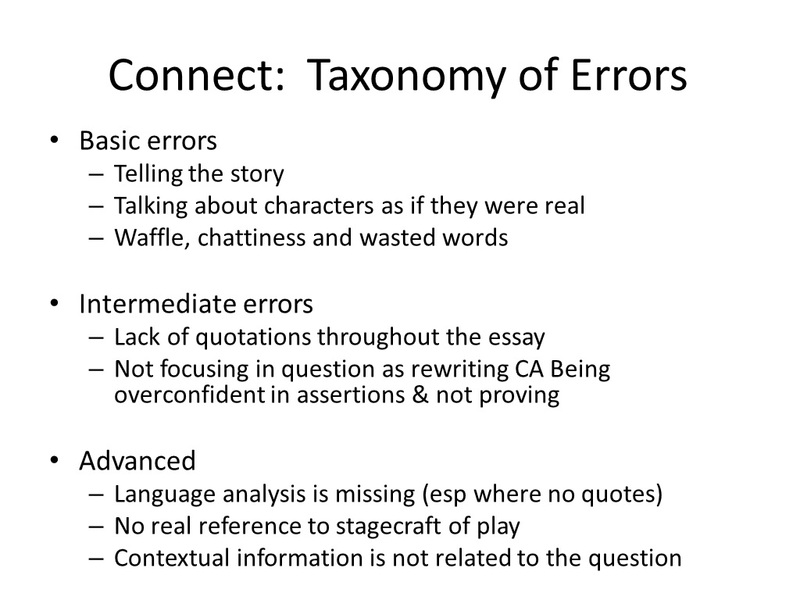 Here's my latest feedback to my Y11 English students, and in it I have focused even more on the creation of a genuine Taxonomy of Errors (that may have been how it was intended and I have just found my way to it the long way around!! ): from the basics that are genuinely beneath this groups of students, to the intermediate and advanced. This feedback was from an essay on An Inspector Calls where the students were (to a greater or lesser extent) all guilty of simply trying to rewrite their controlled assessment work on Arthur and Sheila rather than respond about the Inspector as they had been asked. I was therefore able to show them how the error at the intermediate level was preventing them from accessing the higher grades, and thereby making the feedback on higher level errors virtually redundant (most students achieved only between 17 and 21 marks out of 30 because of their intermediate errors). Here is a very typical response from one of the students that led to this Taxonomy of Errors, and was even one of the better ones because he made sure to refer to the Inspector on four occasions. In the end, though, his best observations were reserved for the character of Sheila and he would be reliant upon the leniency of the examiner at best and, at worst, reliant upon another question coming up that allowed him to crowbar in his understanding of the character of Sheila. In response to the ToE then, I devised a sequence of activities that was focused on using 15 minutes of their 45 to plan effectively to answer the actual question, not the one that they wish had been set. This involved brainstorming what they knew already about the Inspector, selecting apposite quotes (ensuring that at least one of these was from the stage directions to allow the response to include reference to stagecraft - from the Advanced section of the ToE), exploring the language of the quotes for dominant and subversive interpretations and then evaluating the quotes in light of the essay question. And here is the response that the same student generated during this double lesson in response to the activities I had set; activities which had been informed by the Taxonomy of Errors (at this stage of the year my lessons are almost entirely planned in response to their emergent needs). I'm not claiming that it is a startlingly better response, but it does tackle the intermediate error of not focusing on the question to ensure he has a chance at the top marks. Further to this it addresses the advanced error of a lack of reference to stagecraft and deepens his use of language analysis from a straightforward discussion of the word 'horrible' to a more convincing analysis of the words 'taking charge masterfully' in a better quotation that, again, had more resonance with the actual question he had been asked to answer. So there you have it. In my classroom the Taxonomy of Errors is used for three purposes. 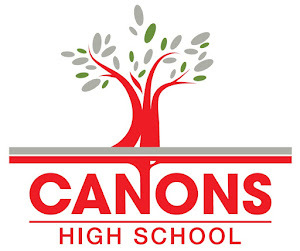 In its most simple guise it tells the students what mistakes have been made, by others as well as themselves, so that they can get a sense of their achievements alongside those of their peers. At a more sophisticated level the Taxonomy of Errors allows me to rank the impact of different errors on their marks and/or grades by showing them how basic or intermediate errors can undermine work that in other ways might have the potential to achieve highly. 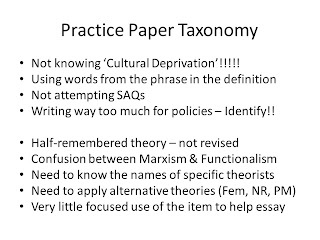 But the Taxonomy of Errors is at its most effective when it informs my planning so that students are taught (or re-taught) the knowledge or skills that had been demonstrated so poorly in their submitted work. 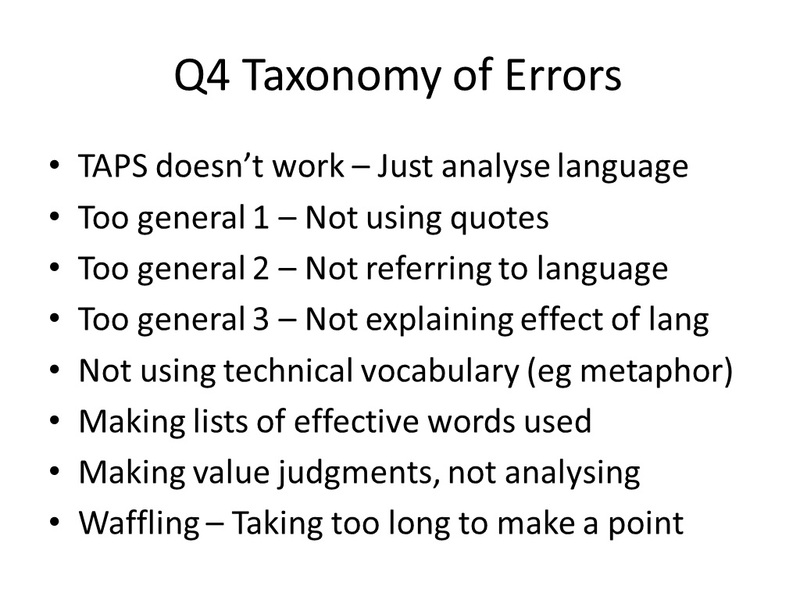 The Taxonomy of Errors is at its most potent when it is used in this way and results in the students being asked to edit or rewrite the error-strewn original in a conscious attempt to improve it. The Taxonomy of Errors is at its most rewarding when it helps make marking have a genuine impact on learning.